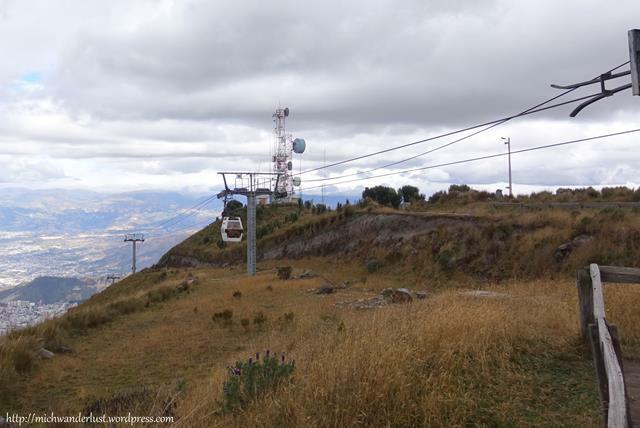 After saying goodbye to Yanapuma on Friday, I went with some other girls from the school to the Teleférico – a cable car that takes you up the volcano Pichincha to Cruz Loma (4,100m above sea level). 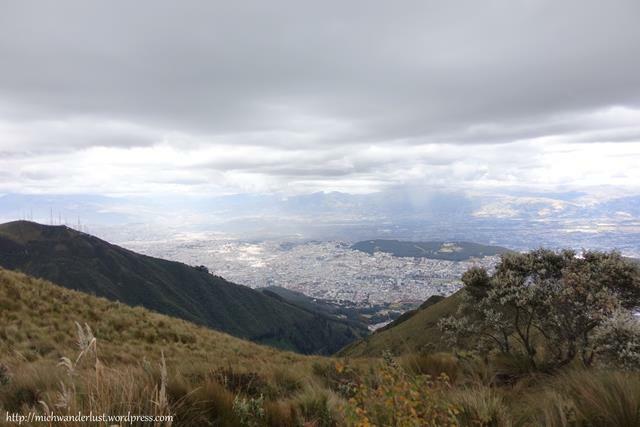 Just another 1,300m above Quito – it couldn’t be that bad… or so I thought. First, the temperature drops noticeably at that altitude. I had only one jacket on (the travel jacket with tons of pockets and cool stuff from Kickstarter) and it was pretty cold! Second, it could be my general lack of fitness but ascending just a couple of metres more left me out of breath. 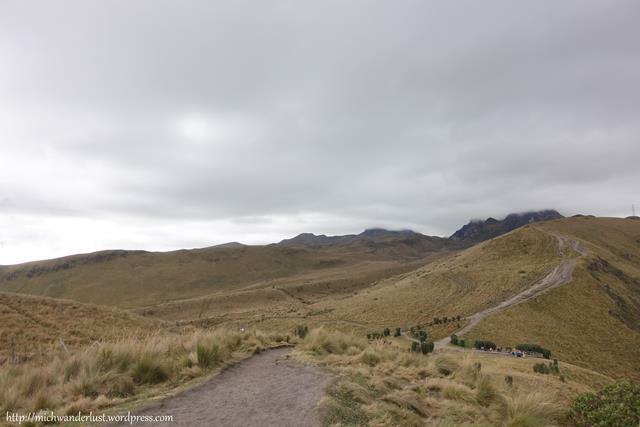 For the very intrepid hikers, there’s a hiking trail up to the summit of Rucu Pichincha (4,680m). It’s rated difficult and apparently takes about three hours. Definitely not something to attempt until you’ve acclimatised to Quito at least! Or, if you don’t want to hike, you could also hire horses (not sure if they were horses or ponies or even mules…). I’d love to attempt this hike (maybe on horseback) one day. The views from 4,100m are already great, though. 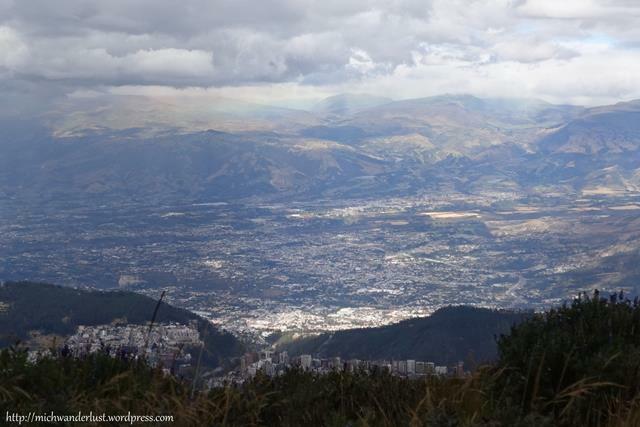 That’s Quito way down there. It was a cloudy day, so visibility wasn’t perhaps as good as it would have been on a clear day, but on the bright side – we saw a rainbow! Can you see the rainbow above? It disappeared after a few minutes, so we were really lucky to have caught it. It’s so high up that there were some clouds below us. I’m finding it difficult to put into words the feeling of being high on that mountaintop, far away from the hustle and bustle of the city and the rest of the world in general. All I can say is that it was amazing. So glad too for the two girls that I went with! I spent the next day wandering around alone (for the most part) and it makes for a very different experience when you have company. I’d have been pretty bored on that mountaintop alone, I think! How to get there: We took a cab ($4) from the Old Town. All tourists would come across this plaza at least once during their visit, I’m sure. It’s flanked by the Cathedral on one side, Palacio de Gobierno on another, and it always seems to be full of people. 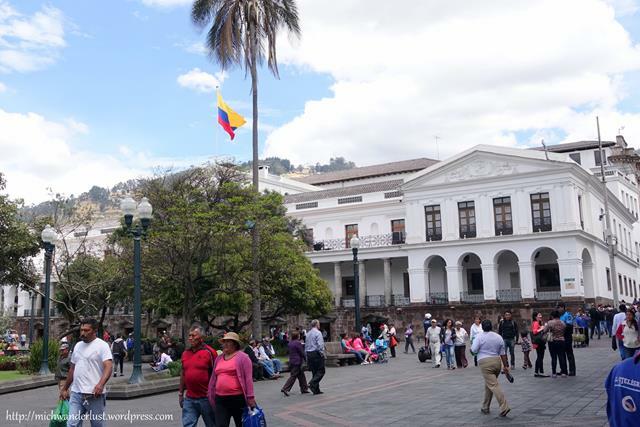 I wanted to visit the Palacio de Gobierno – limited tours are available when the President isn’t there – but for security reasons, you need to leave some form of ID with them – a copy of your passport, driver’s licence, etc. Of course, I’d brought nothing of that sort (I do have a photo but they need hard copies). So, sadly, it didn’t happen. Oh well – another time! 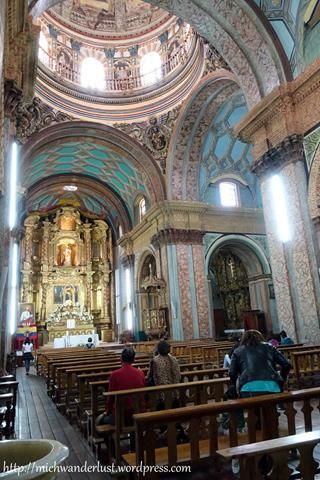 I did pop into another church (with free admission) – La Iglesia del Sagrario. I thought it was already quite ornate! Can’t imagine what La Compañia would have been like. My visit to this museum got off to a good start because admission happened to be free that day! It’s normally something like $3 or S4. I didn’t ask why – don’t look a gift horse in the mouth, and all. 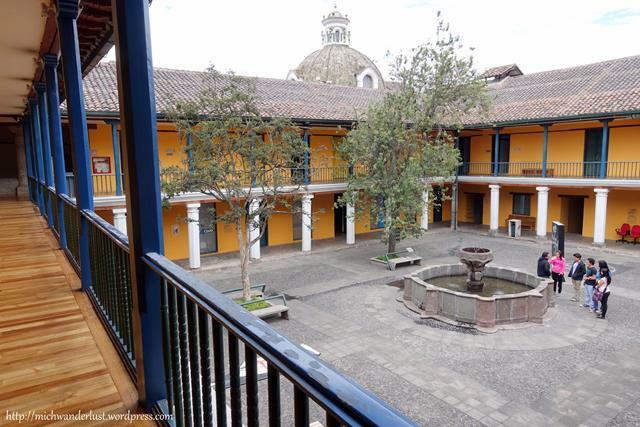 It’s located in the oldest civilian building in Quito (a former hospital), which is over 400 years old. Lots of the old buildings are built in this manner – like 4 sides of a square with a hole in the middle to let in sunlight. 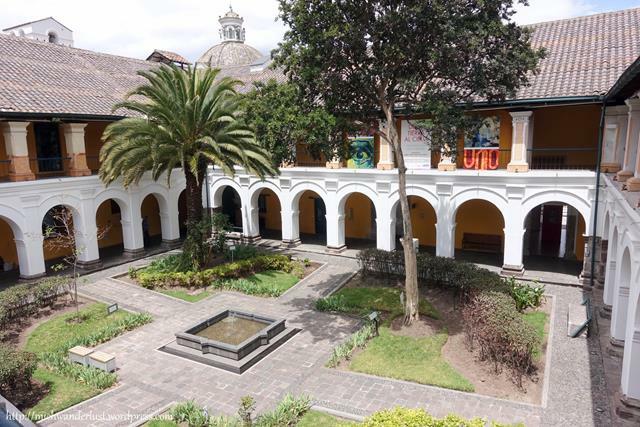 The museum is about the history of Quito in terms of the day-to-day life of those who have lived there through the centuries. 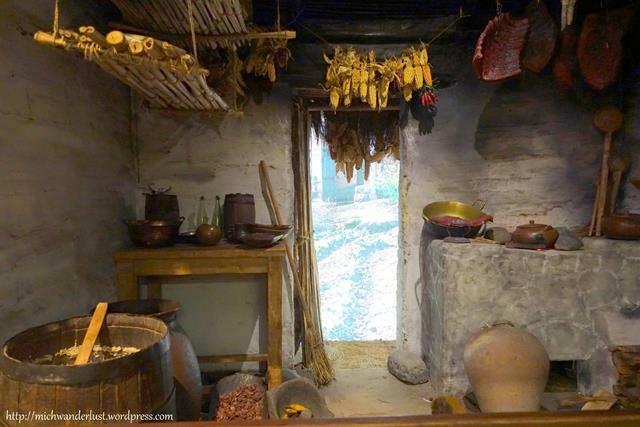 Interestingly, although rice is such a staple food here, it’s not actually native to Ecuador – it was introduced as part of the Spanish conquest. Corn is most definitely native to here, though. They have a huge variety of corn. 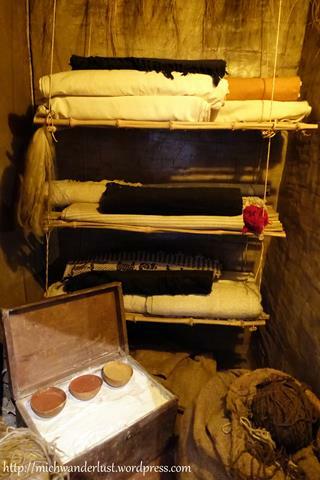 This display was about the natural dyes they used, e.g. blackberries were used to get red dyes. 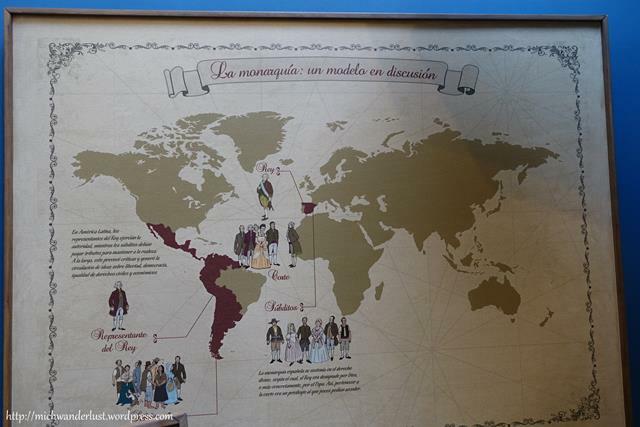 A large part of the exhibits are about life as a Spanish colony and subsequent independence from Spain. 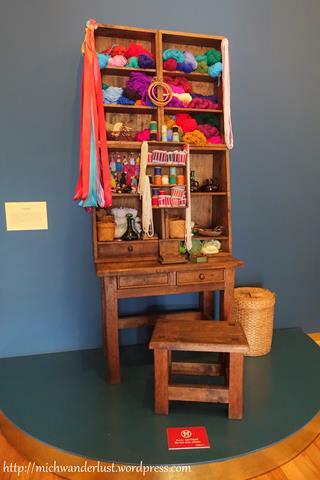 The permanent exhibition ended with a room featuring common occupations at the time of Ecuadorean independence from Gran Colombia (1830). So much has changed since then! The table above was used by women to sell a huge of variety of stuff (looked like mostly yarn and sewing stuff to me) in the squares. 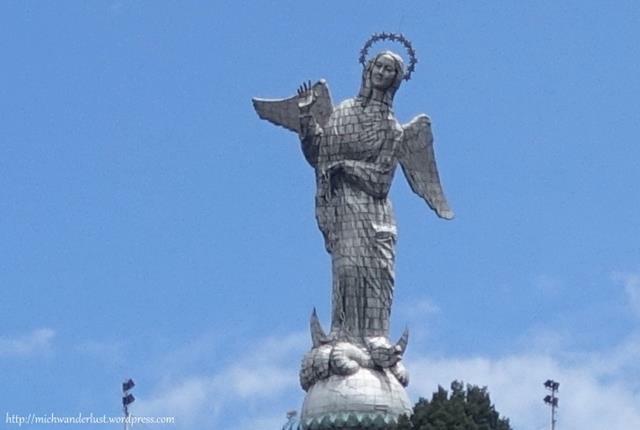 From a little corridor outside this room, there’s a great view of El Panecillo and the Apocalyptic Virgin statue (also known as the Virgin of Quito). There was also a temporary exhibition about an Ecuadorean artist, but I wasn’t that interested. It’s quite interesting to explore the building a little. There are signs highlighting various features of the former hospital, and there’s even a pretty little patio where you can relax for a while! Admission includes a free guided tour in Spanish, but I didn’t follow it because the guide spoke really quickly. Lonely Planet says you can pay a little extra for a guided tour in English, but I wasn’t aware of that option while I was there. In terms of signage, there are a couple of English and Kichwa translations but for the most part it’s in Spanish, so visitors who don’t know Spanish should probably opt for the guided tour. 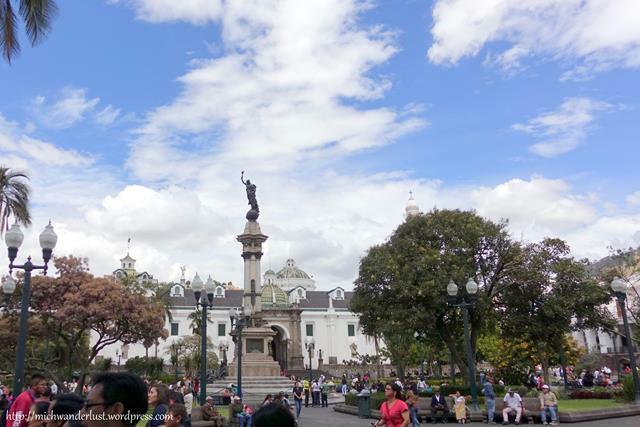 After this museum, I wanted to visit the Museo Nacional (Ecuadorean art) but it’s closed. From a brief conversation with the security guard (which I didn’t completely understand), it seems that it’s due to an earthquake. 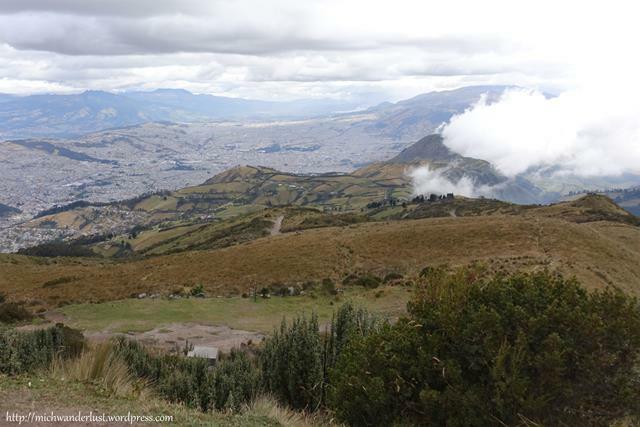 There was an earthquake two weeks ago in Quito, so it could be that one or the big one in April. 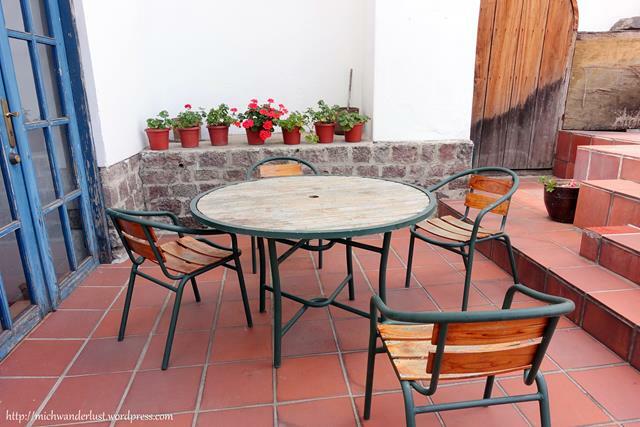 I didn’t know where to go next, so I sat for a while at the nearby Parque El Ejido – a very pleasant place on weekends with lots of families and street vendors selling different types of food. 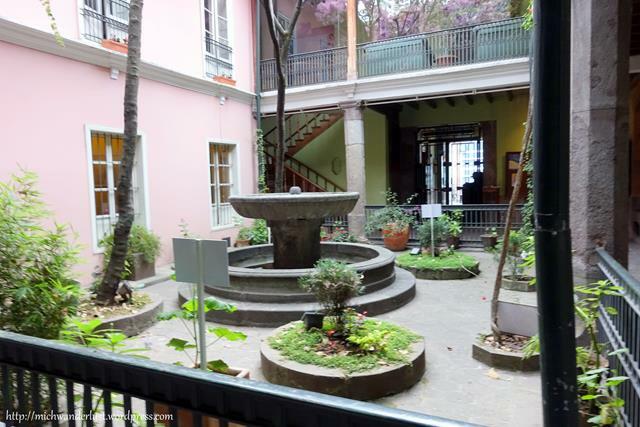 Eventually, I visited the Casa Museo María Augusta Urrutía – a splendidly preserved house museum that once belonged to the very rich philanthropist María Augusta Urrutía. She lived here in the early 1900s. It’s a fairly big house and you get a free guided tour in Spanish or English. It was quite quiet when I was there (4pm on a Saturday) so it was just me and the guide, who explained everything quite thoroughly and kept asking if I had any questions. I felt that my $2 was quite well-spent! One of the things I like about guided tours is that they often give you a better sense of the people who lived there, instead of just the things.